A food blog dedicated to modernist cuisine (molecular gastronomy), sous vide, and the food industry. Less cooking and more thinking. Basically, turn your SVM into an Immersion Circulator. The air pump circulates and the immersion heater gets hooked up to the SVM. Pedro strikes twice in the same thread. This time he demonstrates how to use the SVM/FMM to turn your hot tub into a giant (130L!) sous vide water bath. He gives advice on how to vacuum seal a suckling pig whole, so you too can replicate Heston Blumenthal's Trojan Hog, as well as PID autotune and temperature results. This sounds like madness, but the truth is, most of this pricing isn't too far off the mark... if you are buying restaurant quality equipment. Combine that with the fact that you get a clean, home kitchen quality aesthetic, and the pricing isn't insane, assuming the quality is there. I wonder if this will find success in new construction of luxury homes/apartments, because I have a hard time imagining the person who buys this for an existing home. Previously, I joked before about MTV Cribs, but now I think that would be the only time I see this system. Of course, you can put a sous vide system together that will be just as amazing and save yourself a bunch of money. 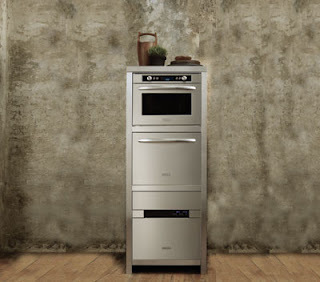 For example, sub out the oven for the a Polyscience 7306c, the gold standard of restuarant/pro immersion circulators and you'll save $1,000 over their combi oven. Of course, it's not a combi-oven. Also, the cabinet is pretty damned expensive. So you'd save another $3,750 right there ;) What could you do with $4,750 in cost savings? How about 158 pounds of Wagyu Ribeye or 475 pounds of Hudson Valley Foie Gras. Would you buy one? Do you know of anyone that would buy one? UPDATE: Received a demo unit for review purposes. The review starts here. 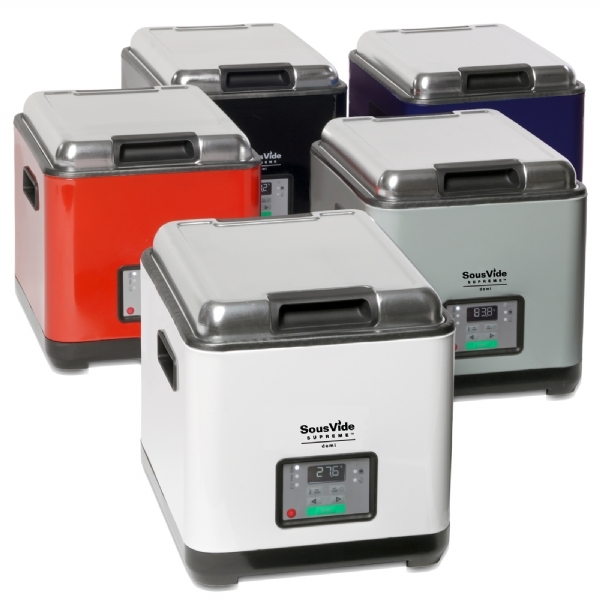 The folks that brought us the SousVide Supreme released a new smaller, model called the SousVide Supreme Demi. The Demi appears to be their iPod Mini version of the Sous Vide Supreme. It's less expensive, comes in a number of colors, and has a smaller footprint. It is pretty awesome that the NYPL continues to bring in chefs like Ferran Adria, Dan Barber, and now, David Chang and Rene Redzepi. For my readers who are not whores to the culinary world, you should know that Rene Redzepi is the executive chef of Copenhagen's Noma. Noma recently displaced El Bulli on San Pellegrino's Best 50 restaurants, ending Ferran Adria's half-decade run as the king of the hill. You now know exactly what I knew prior to attending this event. Given that I now have exactly one hour and twenty minutes worth of listening to him speak, I think we can all agree that I can now speak with great authority on who he is. After all, I am a blogger. Rene Redzepi was the test tube baby of Ferran Adria's innovation, Thomas Keller's execution and specks of Dan Barber's vision and raconteurism. I'll save you a google search raconteurism... not a word. As far as raconteurism goes, a great thread that I would put here if I were a more talented writer is how Rene crossed paths with Grant Achatz at El Bulli. Grant was already at French Laundry and introduced Rene to the food of Thomas Keller via The French Laundry Cookbook. He later helped Rene obtain a stage at The French Laundry. Since I like to make snap judgements based on the tiniest amounts of data, I am quite confident that I could take this and spin a tale of how both chefs were influenced in reverse order and how that is completely apparent in their cuisine. As I am but a hack, I will simply say that Rene staged at both, so obviously they are his parents. Also he said something about how Keller and Adria represent the continuum of cookery. Well, I made that up, partially based on what he said. But, I don't think fact is especially important. Oh sure, there are other commonalities, like his sense of humor. Consider the Noma dish, 'Hen and The Egg'. A playful dish where you receive instructions that include a timer, a number of ingredients including an egg, hay oil, various weeds/green and flowers. A 320ºC (approximately the temperature of the sun) cast iron skillet is put in front of you nestled in wet hay. You are in charge of frying the egg according to the timer, and then putting the ingredients in the pan. Sorry readers, I know you haven't gotten much love lately. If you are a 'foodie' or at the very least a thoughtful customer of restaurants, there have been some great posts to chew on lately. First up, The fine folks at BlackenedOut discuss the finer points of cash only restaurants. Gourmet Live gives you more than you can imagine on the subject of tipping. It begins with the Mr. Pink diatribe on tipping from Reservoir Dogs and then does a excellent job of arguing Mr. Pink's side. Finally, a customer (who also happened to be president of the Wild Salmon Center in Portland) was banned from a restaurant for suggesting, or possibly confronting that they not serve blue fin tuna. I'll write about these things, but I know most of you don't come here for what I have to say on that. So, don't you worry, I have a couple of other great sous-vide/modernist posts coming up too. And tomorrow, I go see Rene Redzepi, David Chang and Ruth Reichl talk at the NYPL.